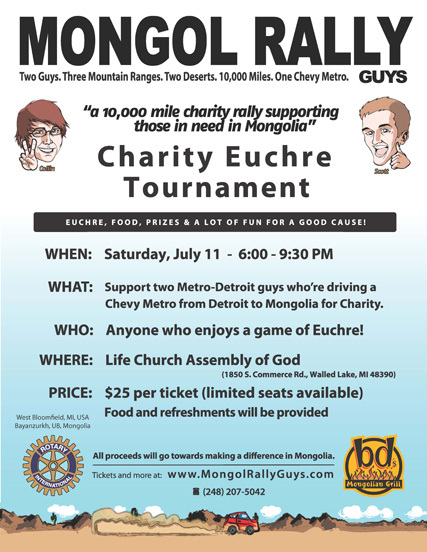 Come one, come all to the Mongol Rally Guys’ Charity Euchre Event being held at the Life Church Assembly of God in Walled Lake, Michigan. For just $25 per ticket you have a chance to walk away with a nice bit of prize money* and assist our charity efforts at the same time. The event starts at 6:00PM and will run until 9:30, with food and refreshments provided for all. This will be our final fundraising event, and we still need more money to meet our charity fundraising goals, so please come out and show your support! * Provided, of course, that you are an awesome Euchre player!